The Riverview Carousel is a carousel in Carousel Hill at Six Flags Over Georgia. While it's not the best, it is also recommended. A vintage ride from the early days of mechanical attractions. On the National Register of Historic Places. 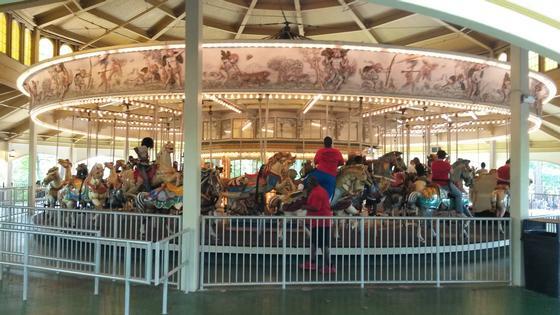 The Riverview Carousel is on the National Register of Historic Places. That alone should tell you that any theme park fan worth his or her salt should pay it a visit while at the park. It is also one of only a hand full of five abreast hand carved wooden carousels left in the world today. It's location on the top of a wooden hill in Six Flags over Georgia sets it apart from the more modern and flashy rides of this end of the 20th century. One of the parks previous General Managers, Spurgeon Richardson called it, "The fine china of the park." More true words were never spoken.